Was missing Malaysia Airlines Flight MH370 shot down in botched bid to stop 9/11-style Islamic terrorist attack? According to a new investigation, Malaysian authorities believed the plane – carrying 239 passengers and crew – had been taken over by Iranian terrorists who wanted to fly it back towards the Malaysian capital of Kuala Lumpur. Acting quickly – and faced with a disaster of global proportions – the allegedly government ordered a warning strike on the plane. But, speaking exclusively to the Daily Star Online, private investigator Noel O’Gara said this mission went horribly wrong and the plane was brought down in the Andaman Sea – as seen by a number of eyewitnesses. 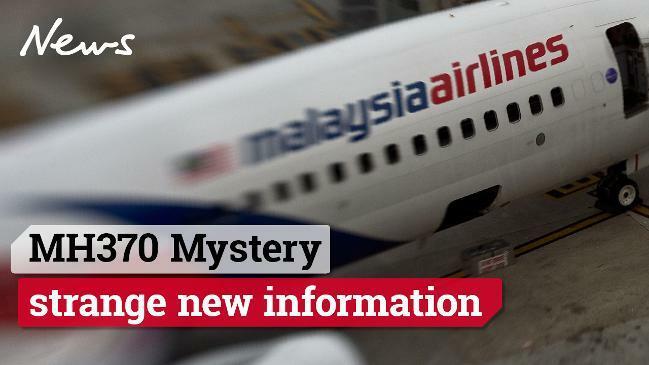 Noel, an Ireland-based journalist, has researched the disappearance of MH370 for four years, speaking to dozens of experts and studying all of the various press releases from the Malaysian government after the crash. Key to Noel’s extraordinary claims are the two young men (below) from Iran who travelled on board the flight on stolen passports. According to investigators, the two men, both Iranians were travelling on forged and stolen passports in a bid to reach Europe and seek asylum there. 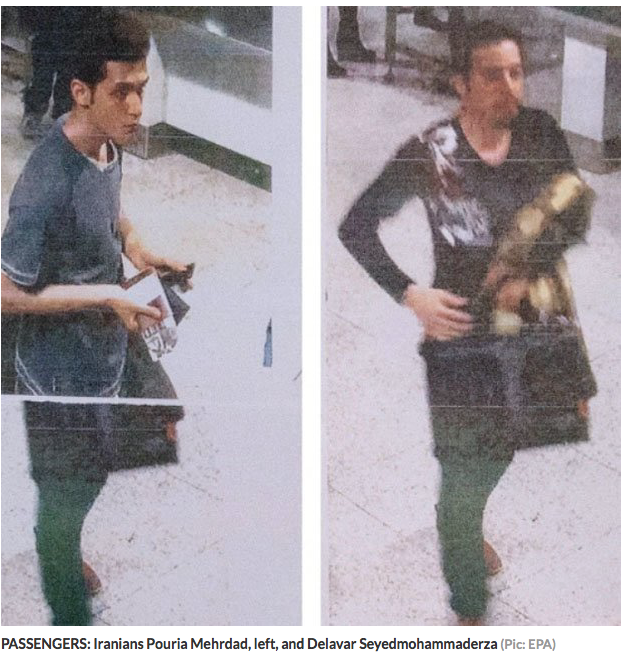 The men, who were identified as Pouria Nour Mohammad, 19, and Seyed Mohammed Rezar Delawar, 29 were friends, according to Malaysian officials. Nour Mohammad had been using a stolen Austrian passport in an attempt to reach Germany to seek asylum and reunite with his mother, Malaysian police said. His mother was waiting for him in Frankfurt. Delawar was believed to have been using a stolen Italian passport.. However, Noel claims, when MH370 was reported as going off its original course, with two citizens from Iran travelling on stolen passports, Malaysian authorities would have feared the worst. The most likely target for a 9/11-style attack in Kuala Lumpur would have been the iconic 452m (1,483ft) Petronas twin towers – the tallest buildings in the world from 1998 to 2004. 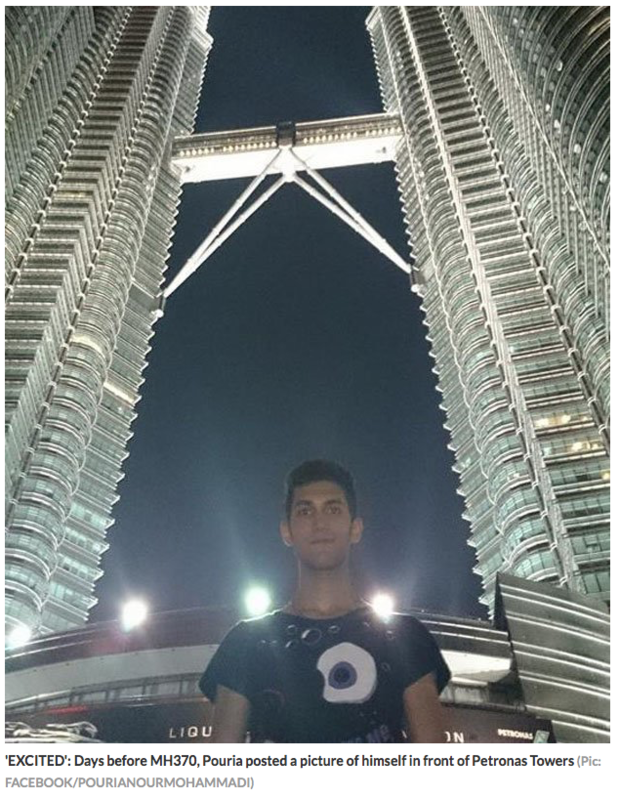 Mehrdad had pictured himself posing in front of the Petronas towers just days before the ill-fated MH370 flight. But, Noel says, there can be no doubt the pair were on the Malaysian security forces’ radar, and the fact they were eliminated as suspects by authorities within 72 hours of the plane’s disappearance is suspicious. “Two Iranians boarding a flight to Germany via China with stolen passports would send alarm bells ringing in any cops ears,” Noel explained. 1. The muslime pilot was on a suicide mission and didn’t care who he took out with him. 3. The muslime criminals with stolen passports hid their true intentions, and sabotaged the plane 9/11-style. LZP, was it never found? Or was it covered up? I heard it was never found, but of course, it could well be a cover up. I don’t believe anything the MSM tells us, or doesn’t tell us. If, indeed, it was not a jihadist pilot who deliberately crashed the plane on his way to eternal paradise, but some desperate guys who just wanted to immigrate out of a sh*thole muslim country, then it is sad that all those passengers died. But, if the govt shot down the plane based on a credible threat of jihad attack on the population, then they just did what they needed to do. Both wearing pants of green, Mohammad’s favorite color, might have tipped off some alert officials that these two weren’t just harmless passengers, but possibly Allahu Akbar terrorists. It certainly looks like the Malaysian authorities shot the plane down. Time to change requirements for a passport; recent picture (already required) AND a thumbprint/fingerprint. “He is not likely to be a member of any terrorist group”. Every muslim is a member of a world-wide group commanded to “Strike terror” in the hearts of all others. “Turhibunna” – Terrorise them, Koran 8:60. Regardless of why MH370 went down due to jihadi pilot or theory mentioned here, it just goes to show what I’ve been saying here for a while now. Trust muslims in only 2 things 1. Kill you and/or 2. Help other muslims kill you. Those passengers didn’t realise this and paid the price with their lives. Why are you posting this [email protected] BNI, it crashed in the southern ocean, or south Indian ocean, tracking by telemetry and wreckage found there show that was the case. Suicide by a MUSLIM pilot . With God, anything is possible. Likewise, with Islam, anything’s possible, except it’s ALL evil. Every single bit of it. Heaven help us. I thought the pilot committed jihad suicide? Well, the plane still hasn’t been found/pulled out of water. The mystery deepens…..
Az, that is still a viable theory. The plot thickens, I must say right from the start the whole way this was handled reeked of an untruth…I was fairly certain the Malay authorities knew more than they were letting on. given the various Islamic connections at play a terror related cause makes sense. the other thing is has even a spec of related passenger/crew DNA or a single body part surfaced yet?? Wow – great conspiracy theory. Now all it takes to make a few millions is a movie producer and some spectacular CGI . Wouldn’t doubt it even a little bit.